This post isn’t meant to scare you off from a DIY kitchen remodel, it’s to prepare you for what’s in store if you do. If we could do it, you can do it too. 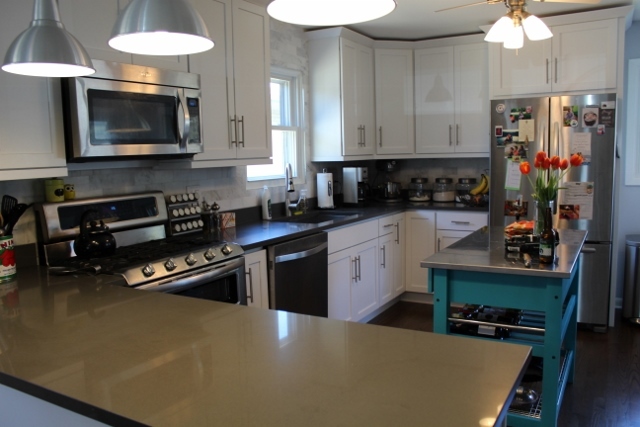 I’m hoping this post will give you the basics on how to go about planning a kitchen remodel, or at least, give you some good ideas on how to start your renovation. Before we re-did our kitchen, I scoured pinterest and all the home decorating blogs I knew to see if there was some definitive list of what to do, in order, for a remodel. Most of what I found was something to the effect of: 1. Set a budget. 2. Hire a contractor. I knew we wouldn’t have a general contractor to walk us through the process, but I needed the steps to do broken down for me. I never really found a good list of to-do’s, so I thought I would help you guys out by making a list of my own, based on what worked and what didn’t in our own remodel. 1. Look at A LOT of pictures of kitchens. Go on pinterest. Read home magazines. Search real estate listings. You will want to know what you like and what you don’t. I’m a visual person, and have trouble imagining how something would look in my head. Seeing images of different kitchen options was crucial in deciding what I liked best. 2. Decide how big of a remodeling job you’re willing to take on. Are you taking the walls down to studs or are you adding a backsplash? If your cabinets are in great shape, but you hate knotty pine, maybe you refinish the cabinets and get new countertops. 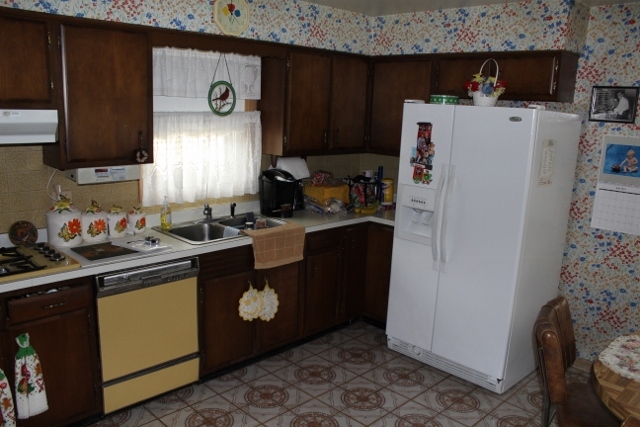 Or, if you kitchen still has goldenrod appliances, like ours did, maybe it’s time to bring the kitchen into this decade. 3. Set a budget, knowing you will almost certainly go higher. There’s your real budget, and what you will actually spend. The two are rarely the same. I would suggest being completely realistic about your budget, and allowing yourself an extra cushion at the top, once you’ve priced everything out. I debated whether #3 should be setting a budget or starting your research, but the two go hand in hand. How can you set a max budget without knowing how much new cabinets cost? Believe me, cabinets can wildly vary in price. My suggestion would be to set your budget for the whole kitchen, but understand that as you get more into the phase of picking out materials, that your budget may have to shift. Visit at least three cabinet shops. Same goes for all of the big buys – countertops, flooring, even furniture. You want to have a good handle on what’s out there and what’s available to you. For me, this was one of the hardest steps because I’m the kind of person that wants to have all the information possible before making any decisions. A few times, I felt stunted from the sheer amount of options. That’s when you have to just stop your research and go with what you already know. 5. Decide on all the big items and where they will go before you even remove one old cabinet door. This is completely where we went wrong. We destroyed the entire kitchen without having a game plan in place for the items we would need. All this does is leave you kitchen-less, and in our case, we were sans kitchen for close to four long months. Please, learn from my mistake and know what you need! This also includes any lighting you want to move. Don’t forget the lights! 6. Understand there is an order of how things are installed. You can’t order the countertop if you haven’t decided where you appliances will go. There is a distinct order of how items are put in to a new kitchen. This part applied to us because we gutted the space, but if you’re ordering any new item, you will definitely want to see where in the installation order it goes. Here’s how it worked for us: Floors first. Then cabinets. Next, install the appliances. Finally, order your countertop (you’ll need to have a sink picked out before ordering). Everything else, in my opinion, is peripheral. You can use a kitchen if the backsplash isn’t up. You can switch out a pendant light later. Focus on the main items that will get you a working kitchen ASAP. Make sure you have what’s needed for the next step. If you do, you won’t have a long gap in work, like we had. 7. Realize a remodel is a process. Like I said at the beginning of the post, we’re STILL working on the kitchen. Not everyday and certainly not as difficult of projects, but we’re still working to customize the space, making it into a room we love for our home. I read somewhere that no room in a home is ever “finished,” it’s always evolving into an even greater space. And there you have it – our kitchen renovation journey. I’ve tried to chronicle it all from demolition day to our current 95% finished kitchen. I hope that by the end of Kitchen-palozza 2015, you are convinced that you too can update the old kitchen you’ve been wanting to re-do for years. I’ll end this kitchen series with a final thought. The kitchen is the heart of the home. Guests will congregate there to grab a tasty appetizer or to freshen up their glass of wine. I’ll make blueberry pancakes there while Dan gets the coffee going a few feet away. You will absolutely be using your kitchen every day. Make it into a space you love.